“Better be safe than sorry.” How many times have we heard this? Certainly, when it comes to boats and what can go wrong, these words of caution couldn’t be more true. Here’s a true story that illustrates the above as recently told to me by a client. This client had moved out of the area and listed their 40’ sailboat for sale with a local broker. In their absence, the client asked the yacht broker if they would “keep an eye” on their yacht. The owner of the boat then contacted their insurance company informing them that they’d moved out of the Bay Area and would not be using the boat. They were curious to know what could be done to reduce their insurance costs. Recognizing that the marina where the boat was berthed required the owner to maintain liability insurance, the owner chose to eliminate all other coverage. Everything was just fine until the boat owner got the call no one wants to receive: the boat had been found with several feet of water in the bilge, well above the floorboards. YIKES! Needless to say, the boat owner truly had a sinking feeling. Not only did they still have the burden of selling their yacht but now they had the added complication of selling one that had been submerged. Worse yet, the resources to make proper repairs were severely limited. Since we’re talking about insurance, there are a few other things to keep in mind. In addition to most marinas requiring that they be named as an additional insured, most boatyards also state within their Service Agreement that your vessel must be insured. This insurance needs to include both liability and property coverage. The policy must provide for coverage in cases of loss or damage in the event of fire, theft, accident, vandalism or any cause beyond the control of the boatyard. Furthermore, your signature on the Service Agreement represents that such coverage is in place. Another item relating to insurance is the matter of what will be covered should you have a claim….heaven forbid. While every policy has its exclusions, one area of coverage, or more accurately lack of coverage relates to onboard systems which you fail to properly maintain. This exclusion is known as “co-insurance”. Here’s an example: you ask the boatyard to repack your stuffing box. In doing so, the boatyard notices the rubber hose that connects to the gland is cracked and needs to be replaced. The boatyard informs you of this deficiency and recommends its replacement but you decide to defer these repairs for another day. Two months later the hose breaks and your boat sinks. OH NO! Not only do you have a major problem but it’s also conceivable, if not a certainty, the insurance company will invoke the “co-insurance” provision. Because you as the vessel owner knowingly contributed to the cause of the sinking by not performing your obligation to properly maintain your vessel, you will become responsible for half the cost of the repairs…or more. OUCH!! While it may seem as if the boatyard is trying to “sell” you work when such matters are brought to your attention, such is not the case at KKMI. Our sole purpose in bringing issues like this to your attention is driven purely by our desire to make your time on the water as safe and fun as it can be. And as we all know, it’s better to be safe than sorry. 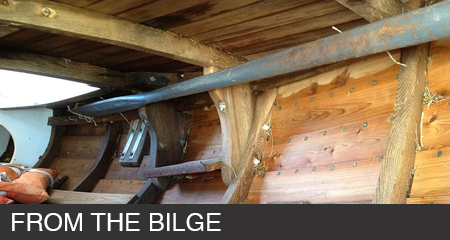 See you in the bilge….or on the waterfront!